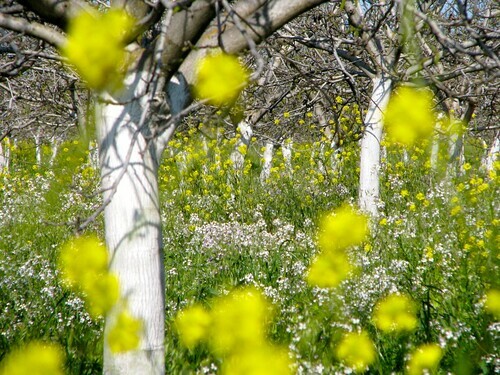 I stood before this orchard overflowing with wildflowers, and I couldn’t believe my eyes. I had to stop and look around. Why was my car the only one, pulled urgent and crooked to the side of the road? Where were all the people? Where was the long velvet-roped line to wait in, before one could stand before it? I looked up at the sky. Dozens of swallows circling lower and lower at a gentle, healing pace. I looked out again and at the moment right before my very eyes. Where are all the people? Where is the line? How did I get so lucky? An absolutely magical moment. All those who didn’t stop should be sorry they missed it. Gorgeous. Just gorgeous. Years ago, before I carried a camera everywhere, I stumbled upon a sunflower patch and pulled the car over and my sister and I got out and wandered around in it. It was magical … until the bees starting chasing us … but until then it was pure beauty. OH God you didn’t show me THIS one!!!!! KILL me! Such beauty! You too, by the way – such beauty.